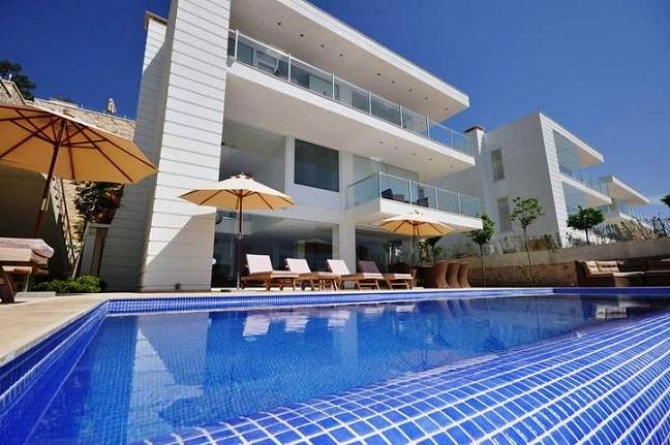 A must see property in Kalkan. Best views possible. Only a stone's throw to Kisla seafront and with some of the best views imaginable in Kalkan, this villa is a must see. If you are looking for comfort, modern interiors, unobstructed views from all rooms and above all a splendid pool terrace to enjoy those beautiful Kalkan evenings, then look no further. This property is right on top of our hit list. The villa sits on ample size private plot with a generous infinity pool surrounded by a spacious pool terrace able to accommodate up to 10 people. The Ground floor consists of an open plan 100m2 living area with French doors opening onto the pool terrace. The kitchen is modern and fully kitted for all uses. Master chefs would hardly find anything to complain about. The focal point of the living room is the beautifully designed gallery / atrium that provides double aspect ceiling over the main seating area, splendid indeed. First floor is home to 2 double bedrooms both with en-suite Jacuzzi bathrooms. The top floor also has 2 double bedrooms with en-suite bathrooms. All bedrooms are sea-facing and have balconies. Views from all aspects of this property are simply breathtaking and the sea projects almost to within the house. Located within 5 minute drive of Kalkan centre and 20 minute easy walk, location of the villa could not be any better either. The villa is ideal for long family holidays as well as a superb buy-to-let opportunity. There is established rental record in place with net annual rental potential in the region of GBP 40,000. From all perspectives, this is a superb property in Kalkan.